You may need a Planning Permit, a Building Permit or both to replace or build a front fence. To help you work out which permits you need, begin at Step 1 and answer the questions one at a time . You may be asked to look at your zone, the number of dwellings on the property and the fence's height and materials. If you are building a side or rear fence, see Replace or build a side or rear fence. If you are replacing a fence you may need a Planning or Building Permit for the demolition of the existing fence. To determine which permits you need for demolition, see Demolish all or part of a building. Consider whether you will be replacing or building an entire front fence, or whether you will be repairing a small piece of fencing material to keep the structure in good condition. For example, replacing some damaged pickets is regarded as routine repair and maintenance. If you are unsure whether your works are considered routine repair and maintenance, contact Statutory Planning. Is the work routine repair and maintenance? If no, check for an Environmental Significance Overlay. If yes, contact Heritage Victoria and apply for their approval. Then check for an Environmental Significance Overlay. Refer to the map from Planning Maps Online to see whether the land on which you plan to build the fence is in an Environmental Significance Overlay. If so, consider the materials out of which the fence will be built. Unless the fence is post and wire, you will need Planning permission. Are you planning to build a fence in an Environmental Significance Overlay out of materials other than post and wire? Are you planning to build a fence in a Land Subject to Inundation Overlay out of materials other than post and wire or post and rail? Consider whether your front fence will be built either on property with more than one dwelling or a property in a common area. Are you building a front fence on a property that has multiple dwellings or is in a common area? If no, look at zone information for your property. Look at the report from Planning Maps Online to see if your property is located n a Residential Zone. Will your fence be located on a property within a Residential Zone? If no, check for other overlays that may affect your works. Lodge the form, application fee and supporting documents with Council. Special Building Overlay (special conditions apply). Consider whether any part of your front fence will be constructed from masonry (brick, concrete or stone). This includes fences that are masonry only, as well as fences that contain some masonry components. 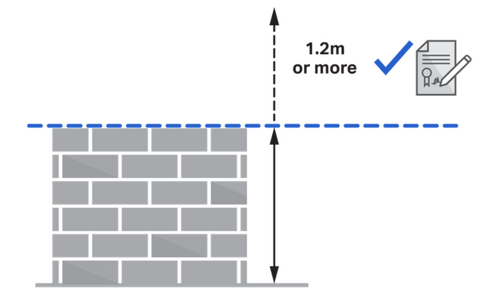 Measure the height of the masonry fencing from the top of the fence to natural ground level. Masonry fencing that is 1.2m or higher requires a Building Permit. Will your project include masonry fencing that is 1.2m or higher? If yes, you will need a Building Permit. See if you also need Report and Consent. 'Lightweight' fencing is any fencing not constructed from masonry. Lightweight fencing includes timber, colourbond or metal. 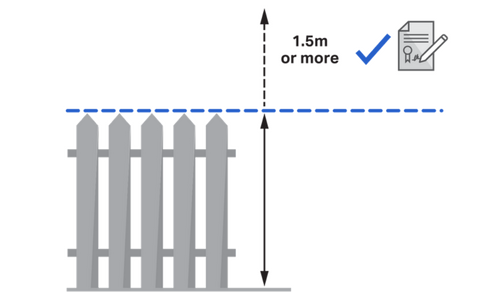 Measure the height from the top of the fence to natural ground level. Lightweight fencing that is 1.5m or higher requires a Building Permit. Will your project include lightweight fencing that is 1.5m or higher? If yes, you will need a Building Permit. See whether you also need Report and Consent. If no, you do not need a Building Permit. See whether there are any other permits you need. The front fence materials and height and the property's declared road status all impact whether you will need Report and Consent for your project. Locate your property on the Map of Declared Roads to see whether the front fence will face a declared road. Use the following tables to see whether you need Report and Consent. 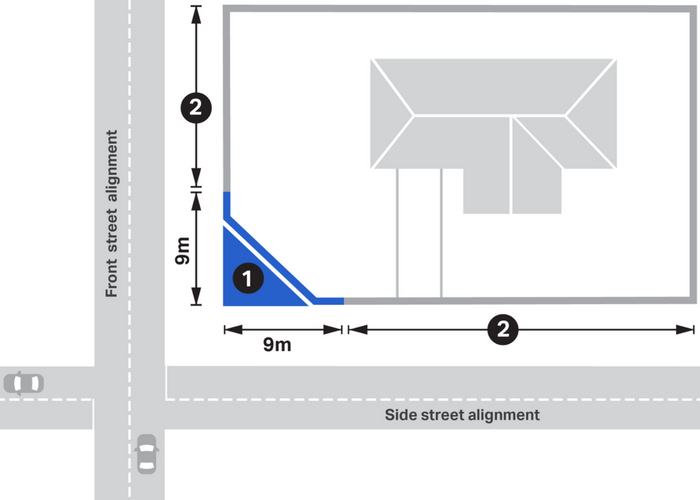 Is the front fence on a declared road? Do I need Report and Consent? Does your front fence require Report and Consent? If relevant, apply for Report and Consent. Contact the Building Services Team if you are unsure whether you need Report and Consent for your project. You may lodge the application for a Building Permit while other permit applications are still being processed, but may only begin construction when all required permits and approvals are granted. See whether there are any other permits you need for your project. Consider whether you need to apply for other permits for your works. impact public assets, such as roads, footpath or naturestrip, you need to apply for an Asset Protection Permit. After all permits have been granted, you may begin construction.